The Everest and The Guineas - Best Australian Horse Racing Tips - Sydney & Melbourne | Rosehill, Golden Slipper, Royal Randwick Races. Tomorrow at Randwick racecourse in Sydney will see the worlds richest turf race run The Everest and our Sydney Racing tips will be there with all the action. 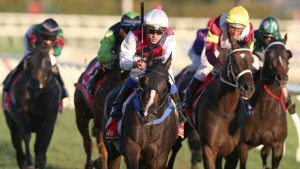 And the action is aplenty at Caulfield with our Melbourne Racing tips and the Caulfield and 1000 Guineas and Caulfield Stakes as part of the Melbourne Spring Racing Carnival. The Everest is a 1200m WFA race at Randwick and brings together the best sprinters in Australia for a classic dash for cash and cash it is with $13 million of prize money at stake. And our Sydney Racing tips with our man Blaazing Ben Perkins will be ready to go with his expert Sydney Racing tips for the big day. Last year it was Redzel and this year a 13 strong field. Every horse with expert analysis and comments! Our analyst man Blaazing Ben is in form remember Hartnell winning the Epsom two weeks ago at $19!! The Melbourne Spring Racing Carnival is in full action this week at Caulfield racecourse with outstanding racing in our Melbourne Racing tips. The three main Group 1 races for this Saturday Melbourne Racing tips meeting at Caulfield racecourse are the 2000m Caulfield Stakes and the colts and fillies races for 3 year olds, the Caulfield Guineas and the 1000 Guineas. All three are feature races of the Melbourne Spring Racing Carnival and are launch pads to the Caulfield Cup next week and the Cox Plate the week after and for the 3 year olds the Victoria Derby and Oaks.